Hi there! It's Jackie here to show you that the ADORABLE new Animals in Love stamps from Taylored Expressions aren't just for Valentine's Day! My husband is probably like most husbands...he TOLERATES my stamping addiction! Yes, he complains that I spend too much time in my craft area and on the computer, but he LOVES to critique my cards! LOL! AND whenever he needs a card he always turns to my stash! He won't admit it, but I know he loves that I have hobby that I truly enjoy. My husband and I will be celebrating our 14th wedding anniversary in the next few months so I decided to make him an anniversary card using some of HIS favorite things! So I bet you're wondering what his favorites might be? Well, you're looking at it! He loves whimsical animal stamps. He'd take that over a flower ANY day! He loves Kraft cardstock, the color green, buttons and he especially loves when I sew on my cards! (he really wishes I'd using the sewing machine for something useful, like hemming and such, but he settles for cards! LOL!) He could probably do without the bow, but I couldn't resist! I stamped the turtles in Memento Tuxedo Black in onto Choice Buttercream, colored them in with Copic markers and while the die was still in place I sponged some Spring Moss ink (PTI) around the edges. The DP is the new Garden Variety from Cosmo Cricket. Here is a view of the inside of the card. I continued with some more of the dp and added the "I'm TURTALLY in love with you" sentiment (from Animal Love Sentiments). I know he's going to love it! Sooo super cute Jacks! LOVe all the stitching and the sweet coloring and the beautiful scallops! He is going ot love this!!! Jackie, this is TURTALLY adorable, in a manly way of course! My hubby is the official card critic in our house too and it's so funny that he even knows the names of a lot of the products! This is a perfect anniversary card!!! ACK - this is adorable! I'd say turtally adorable, but it looks like Saucy already took that line.. sheesh! The green and the kraft look amazing together - your hubby will turtally love it! Ok, sorry - I just had to! Jackie, this card is adorable! I just LOVED your post too. . .adorable! Happy Anniversary to you and your hubby! jackie...that is too stinkin' cute! 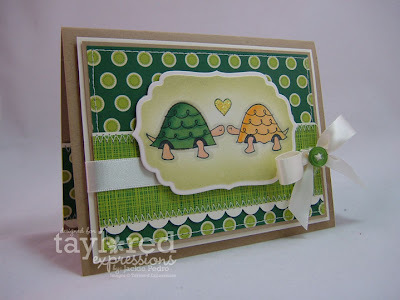 i love the green combo, and those turtles are simlpy adorable! what a hilarious sentiment, too! awesome job! This is precious and turtally adorable!!!! Sorry, gotta join in - this is turtally AMAZING!